A humid and cloudy afternoon, I took a tour of Taal, Batangas with some of the bubbliest bloggers I've ever met for the first time. I really thought my 2012 travels is over after a weekend Surfing trip in Zambales, but towards the last weekend of the year, I received invitation from Ramil of www.pinasmuna.com who spearheaded this little road trip toward the province of Batangas. 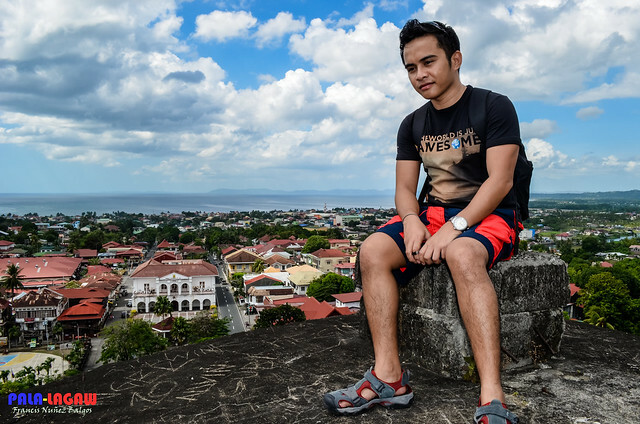 Not only that, upon arrival, we were expected by the towns Department Of Tourism and we are assigned our own guide, a cool young lad with the sweet Batangueno Accent and positive energy. 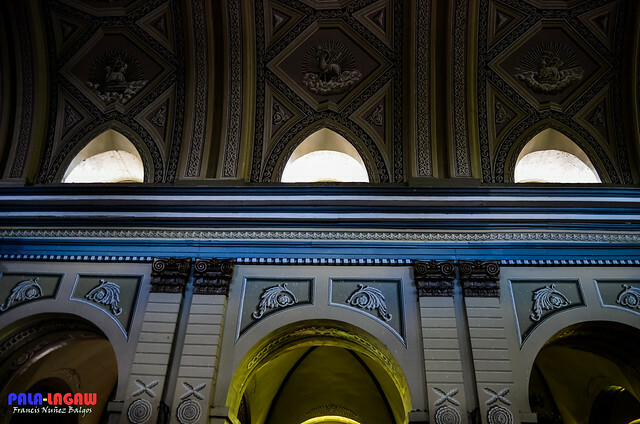 It was a day of photo walks, as we all gathered, and first explored this towering Minor Basilica, the largest church in the Philippines and in Asia. Perched strategically on a hill top, the imposing Baroque style edifice looks more like a fortress than a sanctuary for the faithful followers of the Catholic Church. As you can see, the frontal facade of Adobe Stones is actually higher than the roof, it gives an aura of being a big Archway if you haven't been to the lumbering church inside. The imposing structure was a lot charming once inside. 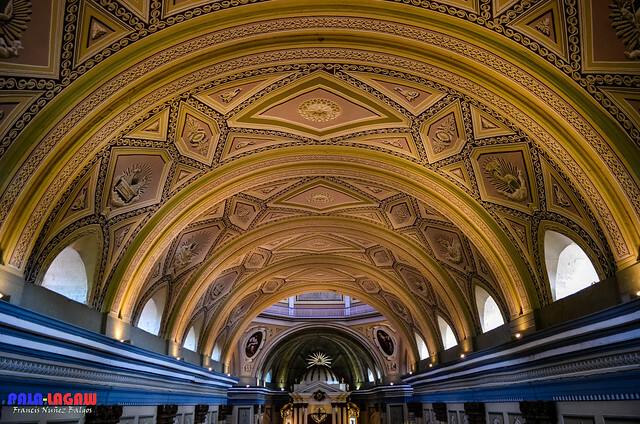 Walls filled with murals from walls to the domed ceiling. Bath in ambient light, it was a delight to photograph its every nooks and crannies. What stopped most of us visitors though is that a wedding ceremony is being held at the time. Charming! which reminds me, I'd like to get married in a church like this. Funny, I have no such proposals yet or any prospective at the moment. My mom is waiting for a grandchild to take care. Being a faithful follower of the church, she would love this Basilica. I thought of my mom all of a sudden. Maybe I can bring her here on her next visit. Talking about exploring a big church, I can have my own jogging fix every morning in here if they will allow. Fancy thinking, but its no mean feat measuring 96 meters long and high, 45 meters wide. Like most old churches, this one is made of Adobe and Coral stones. Making it strong and almost impervious for any impending collapse. 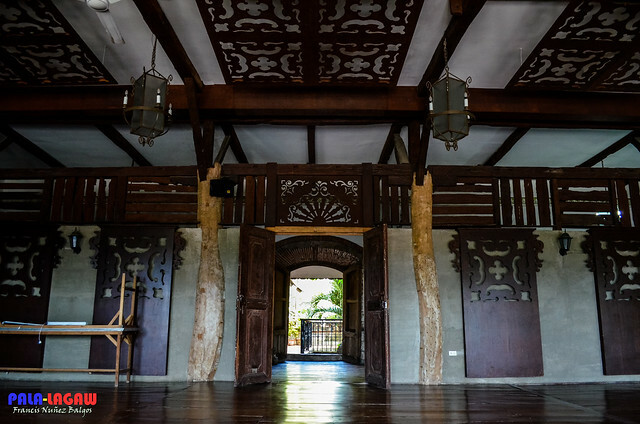 Pastoral house beside the church also serve as its little museum, with antiquities showcasing Taal's bounty of Heritage. As describe by our guide, wood blocks would sometimes fall from the ceiling, blocks that came from the original structure. Old woods and beams that had supported this church for so long. Blocks of reminder for our government to make an extra effort in preserving a heritage like this one, not only for the faithful but for the next generation to have a chance of exploring the church, to walk through narrow staircase that leads to the church roof top and bell, to see and feel how old structures looks like. 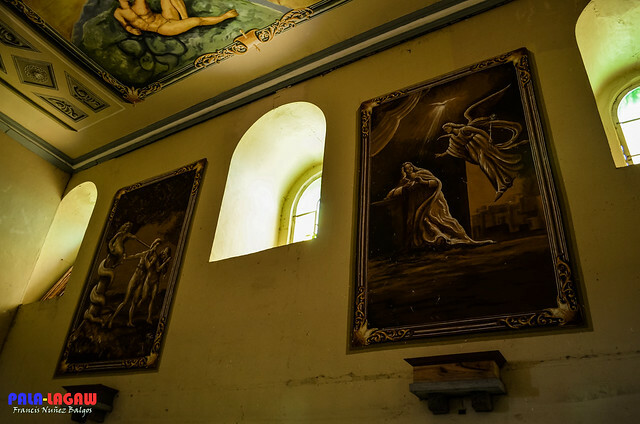 Murals all over the ceiling, with beautiful contrasting intricate patterns and images images of angels and biblical events that lined the corners and the dome. The nave is impressive and is too far from the church threshold, I have to squint if I want to recognise the person that would stand on the altar. 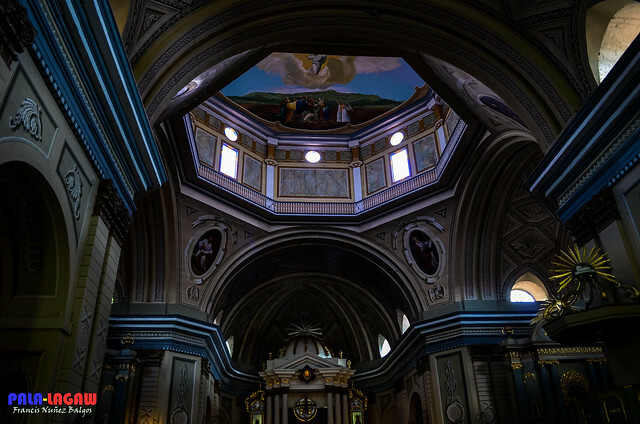 Bright colors of blue, yellow and oranges line the corners, massive columns lined up the whole length of the church each with its own arches and domed ceilings. As was having that Minor Basilica status, this makes the visit to Taal heritage all the more worth it. The town of Taal may have a 400 year old history on its belt, but the current Minor Basilica is over a hundred years old. Having been rebuilt from disaster that wrought the church and the town over the centuries. This Baroque style church was the design of Spanish Architect Luciano Oliver, construction began in 1856 and inaugurated 1865. The church was completed in 1878 by Fr. Agapito Aparicio adding the Doric style altar with the columns lined and the baptistery. The small tower on the left side of the facade that contained the a massive bell was destroyed by the 1942 earthquake. 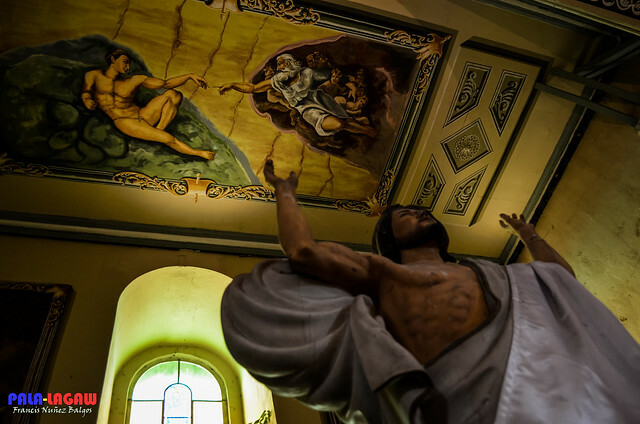 This church was restored in 1953 during the Canonical Canonization of Our Lady of Caysasay. October 22, 1948 when this church was relegated to minor Basilica status. This church has the honorific title as one of the 12 Minor Basilica's in the Philippines, was elevated as the 3rd base on the dates. This Basilica also claims to house the biggest bell in Asia. A claim which gives me my current dilemma, as I know for a fact that there is also another claim from my home province of Capiz. The church bell of the 200 year old Santa Monica Parochial Church in Pan-ay Capiz, weighing at 10.4 tons an 7 feet in height, in perfect condition as compared to this one in Taal that was wrought by disaster and now hungs in silent slumber. The bells dimension is so close to the one in Taal, but having seen the previous one. My take is that the bell from Capiz should hold the record. For reference though, Taal's massive bell is 19 feet in circumference from the lip, 9.33 feet from the crown, and 6.42 feet in height. this King of the Bell fell from its belfry during a collapse from 1942 Earthquake. The event damage this massive instrument that it now lies silent and brooding in the church belfry. There is much more to be said of this beautiful Minor Basilica. Living up to its status, its is an Architectural masterpiece and beautiful inside and out. Even part of our itinerary aside from a visit to the pastoral house is to climb the belfry, walk on the church roof top and of course stand on its highest frontal point. As shown in the photo below, I chose to sit instead as the height is gut wrenching. Circling the roof top, is also viewing the entire town from a high perspective. Its undeniable why this is called a heritage town, seeing as most of the structures are old heritage houses with obvious Spanish influences on it. I can't bare to look at the photos in a long time, feels a lil creepy about its holy like structure on the inside.. gettin married on a church like this would probably have a psychological effect like.. we've been married on that basilica so somehow, "hell yeah you should like forever have faith w/ me.. :D"
This church looks downright old. I think jogging around it is a bit disrespectful for the priests and churchgoers there. Haha. Its old, that the charm in it. The design of the place is very intricately done reminds me of the famous churches in Europe in terms of the interior. The church was really magnificent as we visited Taal last November. No thanks to an unfortunate incident a week ago, more than a hundred shots I took were gone and what's left are the ones I posted a few months back. 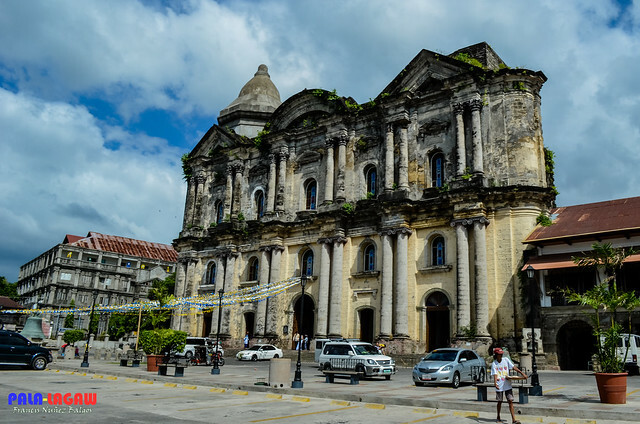 The Philippines is probably home to a lot of Spanish colonial churches in Southeast Asia, kudos to you for sharing this architectural gem with us. I agree with you that younger and future generations should still be given the opportunity to experience such a religious site. Churches this grand and historic should really be given much attention, in terms of proper renovation and upkeep. I'd hate to see such a beautiful edifice crumble as the years go by. First time to hear about this place, and photos says it all, the beauty, the structure, and the history. Great architectural design; very strong structure and the interior has its history to say.For me this CHURCH is so mysterious and magical. Great shots Palalagaw! The church's interior design and architecture are really fascinating.. Excellent post, bro.. Great photos and I truly appreciate that you put a comprehensive details of the church history. Thumbs Up! What I love most about churches and old cathedrals is their historic significance. These structures should be well protected and maintained for future generations to see. such an old church in the outside, but elegantly beautiful in the inside... something our country can be proud of. Yahweh bless.